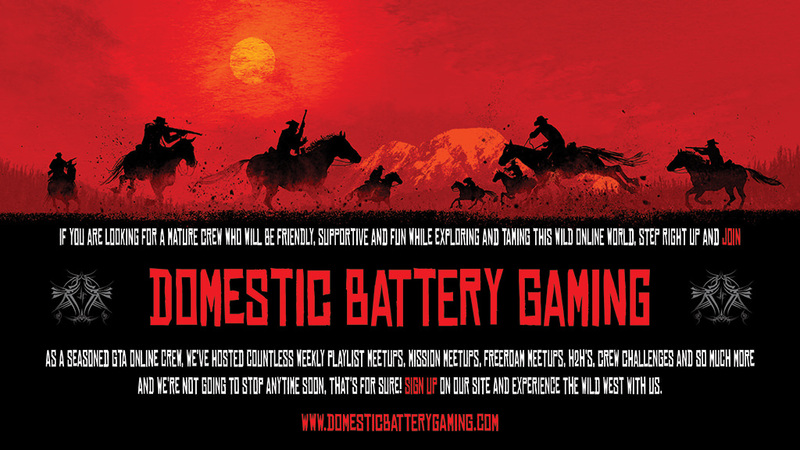 Domestic﻿ bat﻿tery is a group of mature, diverse, friendly, sensible gamers﻿ looking for like minded players to add to the crew. There are many members from all over the world, so there's always someone online from the crew. Founded in 2014 XDBX is an active PS4 crew and looks forward to gaming with you in RDR2, GTA5 plus other games. We aren't like other crews. Some might say they are an active crew, but we mean we are an a﻿ctive crew. We have a bunch of weekly playlist meetups, mission meetups, freeroam meetups. Something every night of week near enough. We have contests to see who can gain bragging rights. We've had 170 crew challenges and counting. We organise Head to Heads against other crews with mut﻿ually agreed rules, 145 and counting.